About Salesforce the award winning cloud-computing service designed to help you manage your customer relationships, integrate with other systems, and build your own applications. 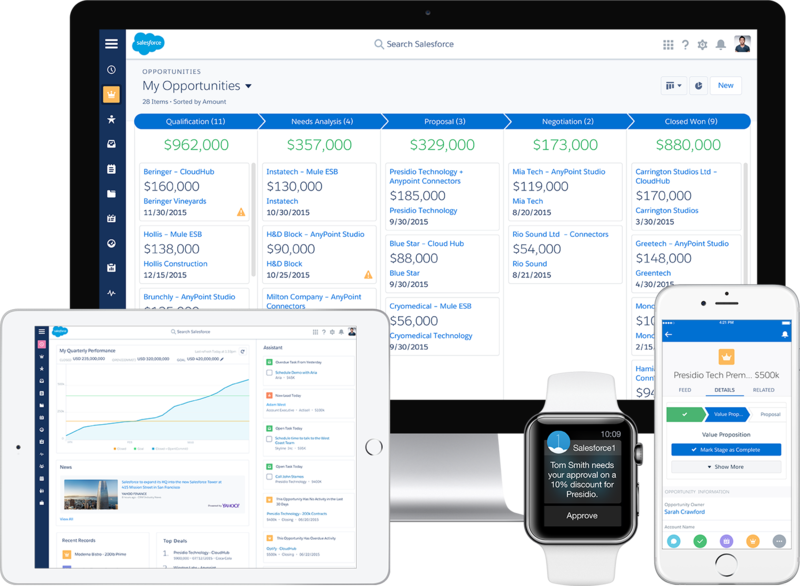 Salesforce includes prebuilt applications (or “apps”) for customer relationship management (CRM) ranging from sales force automation to partner relationship management, marketing, and customer service. Salesforce offers several bundles of its products and services, each geared toward a different set of business needs. These bundles, called editions, all share the same look and feel, but they vary by feature, functionality, and pricing. For example, a feature that is available in Professional Edition for an additional fee may be included in Enterprise Edition. You might choose to start with a more basic edition, then upgrade later as you grow your business. Extend CRM data with apps. Automate any business process, fast. Lightning Platform makes it easy to transform complex processes into apps. Drive productivity for every part of your business with Process Builder’s point-and-click workflow and process tools. Build apps that are automatically connected to all of your Salesforce data. Bring in external data, from ERP and databases with the ease of reference-based point and click integration. With Lightning Platform, every app your users build is instantly mobile. No need to create yet another codebase using different development tools. Just configure your app for mobile and push it live with one click. Learn more about Salesforce platform service click here. Learn about the newest features for sales, support, marketing, and Chatter users, as well as enhancements to the platform.